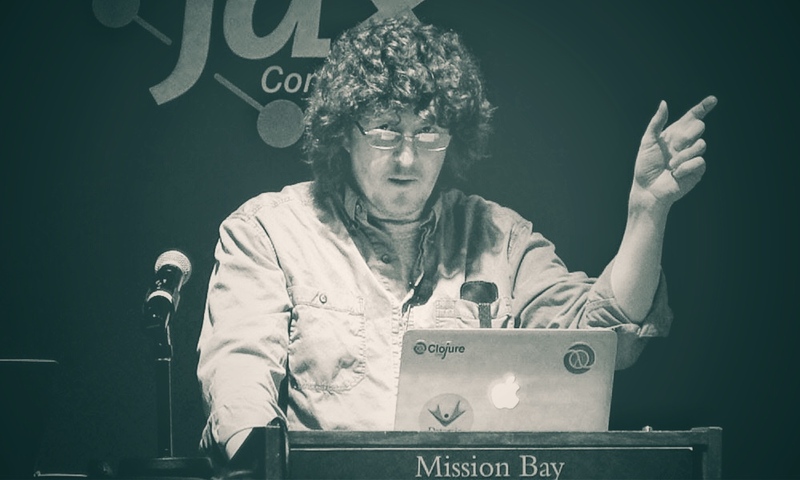 Clojure inventor Rich Hickey is known for his eloquence. His talks like Simple Made Easy are often cited as a favourite when you ask seemingly any savvy programmer. There’s something about the dulcet tones of his radio-smooth voice that brings a little more magic to any kind of philosophising about software complexity. Throw in some light usage of the word “complect”, allow to simmer for five minutes, and you have a seductive Nigella Lawson flavoured dish, garnished with a twist of pretentiousness. This is all well and good until he begins his tired types are bad tirade. Hickey doesn’t understand types. If he did, he wouldn’t be able to say the things he says with any shred of intellectual integrity, and I’d rather suggest he’s displaying ignorance than dishonesty. a -> a; [a] -> [a]; It means nothing! It tells you nothing! — Rich Hickey, Effective Programs. I don’t know if he meant to say “A to A” (a -> a). Assuming he did, that’s an easy concept to unpack, and an important step in understanding parametricity. The first assumption most people make is that a function which takes an a and returns an a could have any implementation. This seems reasonable enough — the value could be anything, so perhaps the function could do anything, right? What if the value is a number, like 1? Could the returned value be the same number plus one? It would be the same type, right? Yeah, but then consider that the idea of “adding one” would also have to apply to any other type of value, and there are infinite types of values. What would True + 1 be? Exactly. It’d be nonsense. What about if we keep the same value, but concatenate itself with another copy of itself? Well, we can’t. A Haskeller might describe this by saying not every type has a semigroup instance. This essentially just means that not every type of value can be concatenated. Create more examples like this to your heart’s content. This function is also guaranteed not to have any effect on the outside world. We know it won’t send your Bitcoins to China. We know it won’t open or close your garage door. We know it won’t hang while waiting for user input. For any of that to work, we’d need to see some hint of IO expressed in the type signature. Therefore, the only thing a -> a could possibly be, is a function that takes a value and returns the same value unchanged. In Haskell, this is called the id function (but referred to in speech as “identity”). This alone is evidence enough that Hickey’s statement of “it means nothing!” is patently and demonstrably false. As it turns out, there’s an awful lot we know about a function, without even reading its implementation! With that out of the way, we’re prepared to unpack his second example of “list of A to list of A” ([a] -> [a]). First, an admission: This could technically have infinite implementations, but not for any reason that Hickey is making any allusions to. It could have infinite implementations in the sense that you could implement it as the input alone, or concatenated with itself, or concatenated with itself twice, or thrice, and so on to infinity. For practical purposes, this distinction is not useful, so it does nothing to support Hickey’s claim that the type signature [a] -> [a] “tells you nothing”. A second admission: While a function of [a] -> [a] is considered pure in Haskell, it could potentially cause the side effect of crashing your program because of the Halting Problem. The execution of this program (theoretically, depending on input and other circumstances) could also push your CPU so hard that your machine overheats, bursts into flames, and melts into its own little pool of glowing lava. That’d be one hell of a side-effect. Again, this distinction is not particularly useful. I include these admissions in the interest of fairness. I want to be clear that I do not intend to misrepresent neither Hickey nor the benefits and drawbacks of a good type system such as the one in Haskell. Let’s retreat to the realm of the reasonable. Could this function be reverse? Yeah, sure. You could recursively call this function with all the elements except the first one, joined with a list of just the first item. Pretty standard stuff. What else could it be? Could it be “Give me the first n elements of the list?” Yeah, that works. You could also drop the first n elements of the list. It’s worth noting at this point that none of the functions we can implement for this type signature actually touch the a inside the . Again, because of parametricity, we’re not allowed to do that. The rules about what we can do with a -> a seem small and trivial, but actually this stuff is fundamental. This principle stacks up with enormously meaningful effect. What about a shuffle? Can [a] -> [a] shuffle its elements? Think about this for a moment. How would this work? Given referential transparency, what would happen on subsequent calls to this function? Once again, there are quite many things we can know about what a function can do just by reading its type signature. You may begin to believe that since I have so far railed about theory, the benefits of all this are also only theoretical. That couldn’t be further from the truth. When you have a type error — and you always get a type error — the question is whether you get it from QA, or your users, or your compiler. The nature of business is change, and this is especially true in the startup world where I tend to reside. If you want to make large changes across a system in a dynamic language without breaking everything, you need to rely on human discipline to have written all the tests. Writing these tests manually is never going to be as quick as a compiler writing them for you. With a good compiler these kinds of changes go from being nearly impossible to just tedious. Encoding invariants in a type system is far cheaper than writing tests. Perhaps when Hickey says things like “it tells you nothing”, he is just using hyperbole for theatrical effect. If that’s the case, it’s effective — It certainly got a reaction from me! However I don’t think it’s an effective method for catalysing thoughtful discussion. Type systems like Haskell’s aren’t a panacea, and there are some things that a language with a dynamic type system can do that are harder to achieve in Haskell (though what this means in the context of a business is a separate discussion). If you listen carefully to Hickey when he talks harshly about types, you maybe identify a number of logical fallacies. When Rich Hickey dismisses the value of a powerful type system by saying “oh it doesn’t really work in practice”, is this the Anecdotal logical fallacy? Because anecdotally, this stuff works for me and for many people I’ve worked with, in practice. It could also perhaps be Ambiguity, or No True Scotsman. And the people defending his take on this? Appeal to Authority. I say this being totally aware that I may be committing the Fallacy Fallacy, but I’m yet to be convinced that an accumulation of design aids does not yield a net benefit. In any case, writing robust software is pretty tough and I’m happy to take all the help I can get. Rejecting an entire field of study (like types!) is not only anti-intellectual, but also does nothing to move the state of our industry forward. I’d say that’s especially harmful now in a time where software errors can bring down a couple of Boeing 787 Max airplanes and kill hundreds of people.